Bake a cake using a ball shaped pan. Cover the ball with white icing using star tip #16 or #18. Pipe stiches on with a #3 or a #5 round tip and red icing. To make the bat, bake a half sheet cake. After it is cool, cut it into three horizontal bars and put them together end to end to form the bat. Then cut the bat shape. Ice the bat with star tip #16 or #18 using brown icing. 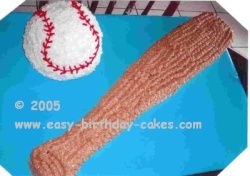 You can vary the color of the cake board covering according to favorite colors or team colors. 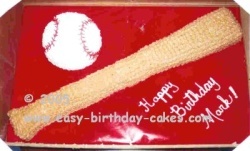 Here are some Baseball Candy Wrappers that go perfectly with these cakes. You can personalized them however you want with your message. They make a great inexpensive yet impressive party favor for both children and adults.